Hobbing manufacturing is a special form of tooling and manufacturing that cuts tooth type geometries. It is the major industrial process for cutting (as opposed to grinding) spur gears of involute form. It forms the gear by rotating the gear blank on a spindle and the cutter on a different spindle at the same time. The cutter is similar to a worm gear, except that it has gashes to form a cutting edge. The hob will make a single revolution for each tooth if it has a single pitch. A hobbing machine is a special form of milling machine that cuts gears. 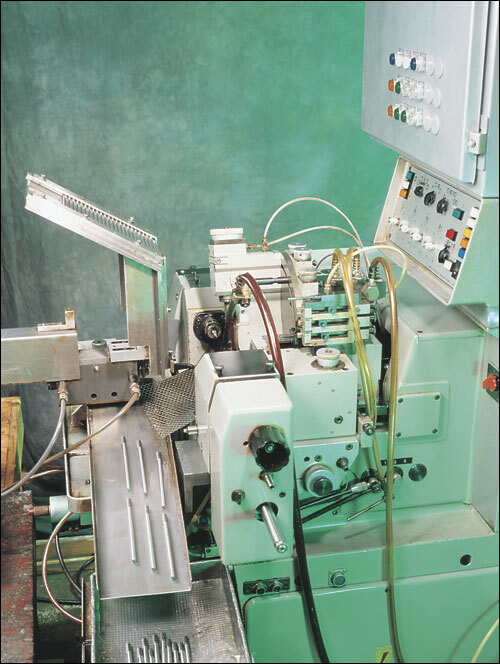 The machine forms the gear via a generating process by rotating the gear blank and the cutter (called a hob) at the same time with a fixed gearing ratio between hob and blank. The hob has a profile given in cross-section by the fundamental rack for the gear tooth profile and is in the form of a helix so that the sides of the teeth on the hob generate the curve on the gear. The helix has a number of cuts parallel to the axis to form the cutting teeth and the profile is suitably relieved to provide cutting clearance. For a tooth profile which is a theoretical involute, the fundamental rack is straight-sided, with sides inclined at the pressure angle of the tooth form, with flat top and bottom. The necessary addendum correction to allow the use of small-numbered pinions can either be obtained by suitable modification of this rack to a cycloidal form at the tips, or by hobbing at other than the theoretical pitch circle diameter. Since the gear ratio between hob and blank is fixed, the resulting gear will have the correct pitch on the pitch circle, but the tooth thickness will not be equal to the space width. Hobbing is invariably used to produce throated worm wheels, but it is not possible to cut all useful tooth profiles in this way; if any portion of the hob profile is perpendicular to the axis then it will have no cutting clearance generated by the usual backing off process, and it will not cut well. The NHS Swiss tooth standards give rise to such problems. Such small gears normally must be milled instead. This technique can generate involute gears, ratchets and cycloid gears. 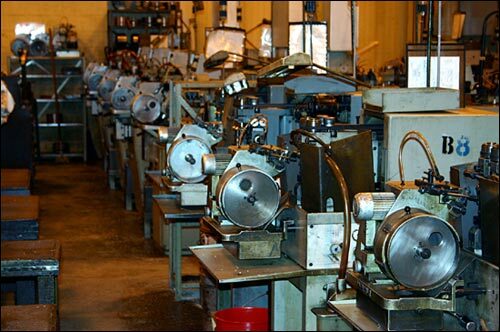 At Devon Precision Industries, this department provides the ability to produce precision pinions and gears to customers that require mechanical timing components and horological movements. Agma quality requirements of Agma 8 or better are achieved. Sizes range from watch movements to gears with a 2 1/2" diameter. Generation of tooth forms from one to several hundred teeth is performed with high micro finishes and dimensional accuracy. Included in this department are pivot burnishing equipment capable of holding tight tolerances and high micro finishes on shafts and arbors. Each gear or pinion uses master gears to accurately measure tooth-to-tooth and center distance dimensions. This department is capable of hobbing spur and helical gears and single and multistart worms and threads and fine pitch hobbing. It produces worms for electrical motors and reduction gear boxes and bone screws for medical implants. Agma 8 quality worms are precisely generated in this department utilizing state of the art worming machines. Master gears are utilized to measure tooth-to tooth and total composite dimensions.